“Help Yourself” by Lori Larusso. 2007. Paintings of thick delicious pastries line the walls of the Grand Hall at the Community Arts Center this month. Cupcakes, sugar cookie bunnies with candy eyes, menacing jack-o-lantern styled desserts line a tray, threatening to consume the viewer. On another wall in the same gallery, a different series of work paintings represent “threat” with bears getting a little closer to a patio than one would like and a rattlesnake warming itself on what appears to be a back porch. In the series of paintings representing threats, perhaps the viewer is seen as the delicious dessert. As a pair of bears approach a patio, they may be eying the viewer as a man shaped cookie. Although the bears appear rather harmless and relaxed, we can’t help but feel threatened by their presence in an otherwise serene landscape. In the foreground, a chair and cushions are surrounded by a gently curved wall and a well-placed carefully landscaped tree. These details seem to suggest that the viewer is within an area of comfort, a safe area reserved for quiet time enjoying nature. The bears tend to represent the truest form of nature, the part that we somehow can’t manage to tame – threatening our leisure. It seems to suggest that even though we intend to enjoy the outdoors, we intend to enjoy the version of the outdoors that we have created. We plan to enjoy our preened, landscaped back porch in the mountains oblivious to our real surroundings. These paintings tend to focus on the contrast between leisure and exterior threats. In the modern world, we don’t often have to face real threats to our existence. We face threats like mortgage rates and stock market fluctuations, but how often do we have to square off with a bear or rattlesnake? The two paintings of this series in the exhibit are actually titled, “Exterior Threat Study,” a clever name suggesting that the threat is both outdoors, outside of the self, and outside of our control. In both paintings, the animals that are actually the “threat” appear to be at ease. The bear is ambling about with its cub, the rattlesnake appears to be basking in the sun. There is nothing in these paintings to suggest that the viewer is directly in harm’s way, but our preconceptions of these animals as “dangerous” tend to set off alarms in our subconscious. Lori’s work has a very high degree of personal style in both technique and image selection. In each of the works, Larusso uses very hard edged shapes to define the images. The works have a very graphic-based feel because most of the layers used to create the images are self contained in their color – that is that they don’t vary within each individual shape, almost like a paint-by-number painting. Each color has its very own specific boundaries. Created from enamel and acrylic paint, it appears as if the layers of paint are thick enough to peel off the surface of the painting. There are a few areas in shadows where subtle blending serves the purpose of making the more hard edged sections pop out even more, and the effect is used very sparingly with great effect. There are also several works in the exhibit that take advantage of the differences between gloss and matte paints. Very glossy enamel may be used on one section of a painting while another may get an entirely flat treatment. 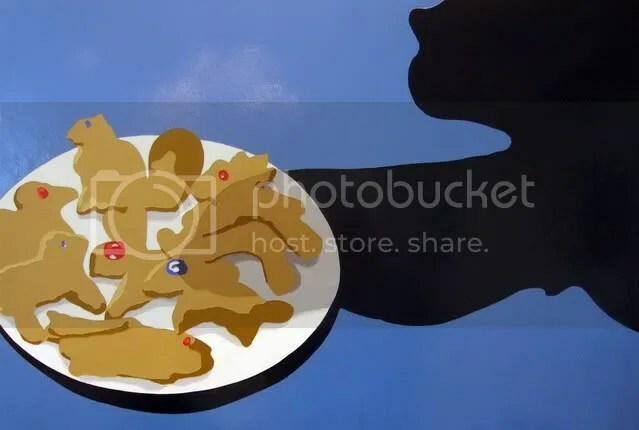 The piece that uses this most effectively is “Sweet Escape.” In this work, a tray of bunny shaped cookies (painted in a very flat paint) resides on the upper left half of the painting. The very glossy enameled violet background is interrupted in a very subtle manner by flat cut-out images of the bunny cookies painted in the same violet tones, appearing to flee from the surface of the painting. I’m fairly certain that the result may not photograph convincingly well, but to see the painting in a gallery under just the right lights, it appears as if ghost images are exiting the surface. Intrigued by the images used in the paintings, I asked Lori where she comes up with the ideas for her compositions. Apparently, the imagery for the dessert series comes from vintage cookbooks. You know, the type where color photography is used in almost a cartoon manner. When Technicolor came along, you could tell that photographers and printers went wild with it. If strawberries were red, you can bet that they were reproduced in the most fire engine red available. Because the colors are so strong and varied from her usual palette, Lori works from black and white reproductions of the images, changing the colors as she sees fit. She also uses old encyclopedias (some of my favorite source material) for her work. When looking at Lori’s work, one can tell that she has an interest in recreating a certain vintage vibe that is popular among contemporary painters. I often wonder if the appeal of vintage or retro imagery stems from the perception of the media of that era by my generation. In my mind, looking back on The Andy Griffith Show or I Love Lucy, it seems that evil, fear, and anxiety simply did not exist. Of course, all of these things existed; it just was not represented in the media to any great extent. To an artist focusing on the concept of contradiction, one of the greatest examples can be found in how people have decided to present their culture in both the past and the present. In the past, the news glossed over and generalized current events, offering a very broad and usually positive view of the world. Now with user created content available all over the web, from Myspace to Youtube, anyone can show their own version of events to any level of detail. Some of it’s true, some of it’s false, and most of it is someone’s version of the truth to be agreed upon or to be disputed. Perhaps Lori’s use of vintage imagery is a way to reference a time when events and images were passed through a certain level of scrutiny, a certain level of filtering to ensure a uniform presentation across all media – where all cakes looked similar, where all strawberries were the same color, where everyone could help themselves. Lori Larusso’s exhibit, titled, “Help Yourself,” will be on display throughout the month of February (2008) at the Community Arts Center on the corner of Fourth and Main in Danville, Kentucky. Be sure to check out Lori’s website at www.lorilarusso.com.